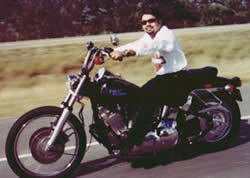 Robert "Pikin" Quiroga grew up with three siblings, a sister Rosa Elia, and two brothers, Epifanio and Alejandro. His parents are Elidia Solis and Epifanio Quiroga and his stepfather is Raymond P. Solis. He graduated from Memorial High School in 1987. Robert's love for boxing was second only to his love for his two daughters, Crystal Marie and Catheryne Elidia. After his boxing career ended, he became a team leader at Center for Health Services, where he assisted troubled and handicapped children. In November of 2000 Robert took on a new challenge and began a career in car sales, working with Red McCombs. He quickly established himself as a top salesman, winning Salesman of the Month awards four times in 2002, five times in 2003, and five times in 2004. In 2003 he was named Salesman of the Year. But Robert is known to the world as one of the pre-eminent super flyweight boxers in the history of the sport. A professional boxer aspires to become world champion in his weight division. Becoming world champion while being celebrated as a great fighter with heart, courage and passion in the ring comes to but a few and Robert was one of those fighters. His exploits in the ring were many but his personality, his desire to be the best and his love of family is what separated Robert from many ring pugilists. His life outside the ring characterized the type of person Robert was – a champion, in and out of the ring. April 24, 1990 With an impressive 14-0 record, Robert traveled to Sunderland, England to challenge Juan Polo Perez for the International Boxing Federation Super Flyweight title. The fans at the Crowtree Leisure Centre found out what the fans at Sunken Gardens and Freeman Coliseum already were aware of, they were watching a determined fighter on his way to making his dream a reality. Robert scored a unanimous decision to claim the title, thus becoming the first boxer from San Antonio to win a coveted world championship. Robert received a hero's welcome upon his arrival in San Antonio. October 6, 1990 Robert made his first defense of his title against Vuyani Nene. The fight was in Pagliara, Italy. Always a boxer on the offense, Robert gave Nene no chance as he stopped Nene in the fourth round. The win solidified his stature as a true champion with the mindset to stay that way for some time. January 26, 1991 Again, San Antonio fight fans would have to wait to see their hometown hero fight as champion as Robert made his second title defense in Italy, this time in Capo D'Orlando's Pallazza dello Sport. This time his opponent was Vincenzo Belcastro. Two judges scored the 12-round bout in favor of Robert by scores of 120-110 and 117-111. A third judge favored Belcastro by a 115-114 margin. Robert had successfully defended his title for a second time. June 15, 1991 A date that may live in the boxing annals forever. Robert's first title defense in his hometown proved to be a memorable one. In a fight that was named Fight of the Year by Ring Magazine and later the best ever super flyweight fight ever, Robert and "Kid" Akeem Anifowoshe put on a display of raw courage for 12 brutal rounds with Robert finally getting a unanimous decision victory. Anifowoshe collapsed in the ring after the scores were read and was rushed for emergency surgery to relieve pressure on the brain. Robert had successful title defense No. 3. February 15, 1992 Robert returned to Italy for his fourth title defense, this time against undefeated Carlos Manuel Mercado in Salerno. Not showing any ill effects from his battle against Anifowoshe, Robert scored a unanimous decision. July 11, 1992 Title defense No. 5 finally landed Robert in the bright lights of Las Vegas as he faced Jose Ruiz at the Aladdin Hotel. Ruiz proved to be one of Robert's toughest opponents but the San Antonio boxer again showed his heart and determination in escaping with a majority decision. Five successful title defenses earned Robert a special ring from the IBF. January 16, 1993 Almost three years after capturing his world title, Robert returned to San Antonio for his second defense in his hometown. A frenzied crowd greeted the local hero but this time Robert fought a challenger in Julio Cesar Borboa that was just as hungry and courageous as Robert had been more than two years earlier. Not knowing the word "quit" Robert fought a losing battle against Borboa and the ring physician stopped the fight in the 12th round. In seven title fights, Robert fought into the 12th round six times. In what could be considered an anomaly for boxers, Robert showed great class and loyalty in a sport not known for either. 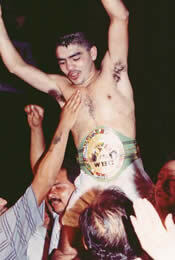 He spent his entire amateur and professional career with one trainer, Joe "Angel" Lopez. The two developed more than a trainer-boxer relationship but a father-son one. Lopez's guidance and Robert's will to win have set the standard for future trainers and boxers to reach. For most of his career, Robert was managed and promoted by Rich and Sandy Lander of San Antonio. His title opportunity came under the Cedric Kushner banner and he was later managed by the late Eddie Garcia. Local car dealer Ernesto Ancira was instrumental in helping Robert late in his career. Ancira sponsored the last fights in Robert's boxing career. 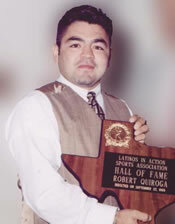 Robert was inducted into the San Antonio Sports Hall of Fame on February 1, 2002. His plaque with his likeness hangs among the best athletes and businessmen associated in sports at the Alamodome. Robert is also an inductee of the Laredo Hispanic Hall of Fame and the San Antonio based Latinos in Action Sports Hall of Fame. ©2004-2019 by the Quiroga Family. All rights reserved.